This native tree is deciduous during winter and when flowering. The distinctive feature is the fruits as the flower are relatively insignificant but the mature fruits are eye-catching. 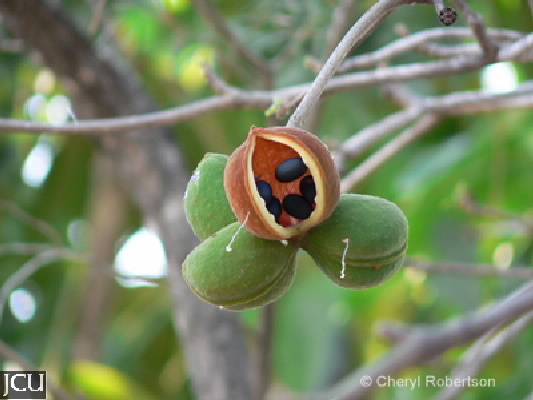 The fruit is a follicle up to 8 cm long which, changes from green to red at maturity, at this stage it splits open to reveal black seeds about the size of a peanut. The seeds are edible but the seed coat or testa should be removed first and don’t eat too many at once! The remains of old fruits may be found on the ground for awhile. Leaves are simple to about 9 x 6 cm and there are stellate hairs on the lower surface. The petiole is about 3 cm long. New growth appears after flowering or even later depending on how water stressed the tree is. It is related to the Illawarra Flame Tree.